This Large-Diameter Mini Tube Cutter is an easy-to-use professional plumbing tool. Used to cut copper tubing as well as Sch. 40 PVC and Sch. 40 CPVC tubing. This tool is great for working in tight spaces. Work faster and more efficiently with the versatile High Heat Torch for Fast Work Times, designed for a wide range of jobs including soldering large diameter copper pipes, brazing and heat treating. The optimized swirl flame burns hot and efficiently for maximum heat output and fast soldering times. The auto start/stop ignition lights and extinguishes with the push of a button, while a run-lock button keeps the torch lit for continuous use. The BrassCraft flexible flat sewer rod with adjustable handle and spear point roller head, quickly and effectively clears most blockages in stacks, clean outs & floor drains. MASTERS LUBRICATING OILER is premium grade, high viscosity lubricating oil for general applications. It can be used on rotating and reciprocating equipment, bearings, motors and slides to reduce sludge and sticking in close-tolerance components, providing superior anti-wear protection. MASTERS LUBRICATING OILER has outstanding resistance to heat, long service life, and is nearly insoluble in water. Large Diameter Mini Tube Cutter This Large-Diameter Mini Tube Cutter is an easy-to-use professional plumbing tool. Used to cut copper tubing as well as Sch. 40 PVC and Sch. 40 CPVC tubing. 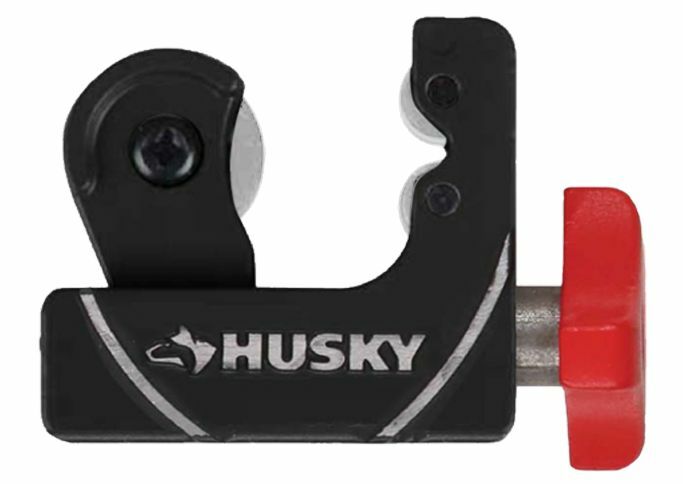 This tool is great for working in tight spaces.